I’ve been presenting my watercolors without glass for quite some time. I love the clean look! Here’s everything you need to know to present your watercolors using this method. In the video, I demonstrate one way to do this, using the method (and products) I use myself. Below the video is a description of other options, info about the pros and cons of other methods and products, and some info on where to find the products you need. A mat, frame and glass provide works on paper with some sort of rigid support, and protection from damage from water, airborne contaminants, and light. To present a watercolor (or other work on paper) without a glass and frame, we need some other way to provide this support and protection. Pretty much anything that will provide the work with support and a way to attach hanging hardware to the back will work. I glue my work to Ampersand Gessobord (like this), but you could glue your watercolor to primed (and painted, if you like) canvas, Gatorboard, foamcore, hardwood painting panels, hardboard, MDF. Or, you can make your paper slightly larger than the support to give the effect of the paper simply floating above the wall (mounting on half-inch Gatorfoam, for example). If you do this, the edges of the paper will be unprotected from getting bent or caught on things, so I’d only do this if the hanging location is pretty protected. You could also do this within a deep frame, however, so that the paper appears to float. Just like a normal float-mount, but without requiring glass. This provides the least protection, but you might still consider it worthwhile if you like the look. Ampersand Gessobord, as its name implies, already comes with a coating of gesso on the front surface. 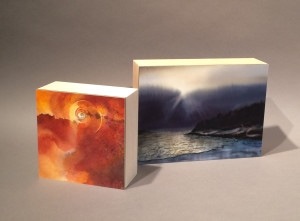 Many pre-stretched canvases also come already gessoed. These supports need no preparation, unless you wish to paint the surface or edges a coordinating or contrasting color. If you are going to use foamboard, I suggest you use the acid-free variety (for example, these). Hardboard, plywood or MDF also make good supports. If you use these, it’s a good idea to add a layer of acrylic medium as a barrier to prevent discoloration. Acrylic medium (which we will use as our glue), will act as a barrier to protect the paper, provided there is enough medium to make sure the paper is not in contact with the wood. To be on the safe side, I’d pre-coat the support with a couple of coats of acrylic medium to seal it before gluing. You’ll want to spray several thin coats, instead of saturating the paper. You don’t want puddles, and you don’t want to get your watercolor so wet that the color starts moving! A bit of practice with this is a good idea. Make a sample sheet with some fairly heavy applications of paint and get the hang of spraying with those, instead of a painting you really care about! I usually apply 2-4 thin layers of fixative. At this point, I can judge by appearance if I have a good seal. You might spray thinner or thicker layers than I do. Again, test it out on a sample sheet first! If you are working on YUPO or Terraskin, or some other extremely slick surface where the slightest moisture might move the paint, you will probably want to skip down to the part about Golden MSA spray varnish. If you were at the demo, you heard me talk about SpectraFix. I was recently at a workshop taught by Bob Burridge where I heard about this great (I thought) solution. This fixative is casein (milk protein) and grain alcohol in a pump spray bottle. No hazardous materials (you could probably drink it, although I can think of tastier adult beverages). No worries about spraying indoors—a big plus for lots of us in the winter! Unfortunately, when we tried it at the demo, there was still some smearing of heavier applications of pigment. I’ve been doing more testing, and I’m pretty sure the problem is humidity. I think if the humidity is about about 65%, SpectraFix may either not dry completely or take a very looooong time to dry enough to stand up to brushing a water-based coat on top. Might be why it works fine in California and not so great in Wisconsin (in summer, at least). I’m going to rescind my recommendation of Spectra Fix for now and keep testing. If I figure out a way to get reliable results, I’ll let you know. In the meantime, I’m going to recommend sticking with some sort of acrylic spray. There are several different Krylon sprays, and many are suitable (read the labels!) for use on watercolors. Sold as a fixative and topcoat and relatively easy to find in art supply stores and some hardware store paint departments. Aerosol can, so you have to spray outside. The gloss finish is the easiest to find, and you can use it even if you want to end up with a matte finish, because you’ll be applying a topcoat and/or varnish over it. The final layer or two determines the gloss, so your topcoat or varnish is the product that will determine whether you have a gloss, satin or matte finish. This is what I use in my airbrush, and I didn’t cover it in the demo because most of you probably don’t have an airbrush, but — duh! — for many years before I bought my airbrush that I just used a mouth atomizer. I don’t know why I didn’t think to mention that option! If you wind up hyperventilating when you use a mouth atomizer, the Preval sprayer is an alternative. It’s basically a little aerosol spray can that you can fill with your own paint. The Preval sprayer is probably the easiest method, but you do have to buy refill cans of propellent. Another alternative is to put the airbrush medium in a pump spray bottle that makes a fine mist (like the one the Spectra Fix comes in, or the type used for hair spray). If you choose to do this, I would suggest you empty the airbrush medium out of the spray bottle after each use, thoroughly rinse everything with water, and spray a good amount of water through the nozzle to make sure the acrylic doesn’t dry in the nozzle and clog it. Golden makes a removable acrylic varnish that is mineral-spirits-based and comes in an aerosol can. I’m not a fan of either mineral spirits or aerosol cans BUT if you have a really touchy piece that can’t tolerate even a light mist of water, this is the way to go. Once you have several coats of this applied, you should be able to proceed carefully with the remaining steps. However, abrasion can remove both watercolor and acrylic from YUPO, even if there is no moisture involved, so you’ll need to be gentle during the mounting step. Again, if you’re working on something besides regular watercolor paper, PLEASE do some testing before you try things out on a painting you care about! After you have fixed your watercolor, you can apply a protective acrylic coat with a brush. This would be called a topcoat if it’s the final coat. If a removable varnish is applied over it, then this coat is usually called the “isolation coat” because it isolates the painting from the varnish to protect the painting if and when the varnish layer is removed. I usually apply 2-3 thin layers. This gives me better control, and a nicer finish. Plus, if I miss a spot in one layer, hopefully I’ll catch it in the next. One option for your topcoat is to use Acrylic Soft Gel Medium, thinned with water so that it brushes out nicely. I can’t give you exact proportions, because different brands have different consistencies of gel. You’ll have to experiment a bit and see what you like. You CAN use liquid medium, though, if you are careful applying it. If you do, it’s recommended that you wipe it down with a damp cloth after it dries and before applying the next coat. This removes most of the surfactant, which can also sometimes cause clouding. Again, gloss, satin, matte—whatever finish you like is fine. They all protect equally well. Some people feel that you should use gloss everything up to the final coat or two, so there is no loss of clarity from multiple coats. I can’t tell the difference, so I don’t worry about it. Read the label carefully when you buy it, though. It’s sold in hardware stores as a floor and furniture finish. The water-based and oil-based varieties are usually sold side-by-side, but they are NOT THE SAME! The water-based version is an acrylic resin, the oil-based version is polyurethane, which is a different plastic and not what you want (it’s subject to yellowing over time, for one thing). You can also use one of the products sold in art supply stores as Acrylic Varnish for your topcoat or isolation coat. The only downside to this is that it’s probably the most expensive option. Once you’ve applied a couple of layers of topcoat, the painting is protected well enough to move on to mounting it. The “glue” to use for mounting is Acrylic Gel Medium. It sometimes comes in different consistencies—soft, regular, hard—but brands vary. Softer is easier to work with, so if a brand offers the option, go with soft. But any gel medium will work, and you can thin it to a good working consistency, You do not want it as runny as Elmer’s glue, but you do want it thin enough that you can smooth everything down without globs and blobs showing on the front of the work. DO NOT use Elmer’s or Yes! Paste. They don’t give a strong and durable bond (especially for larger pieces). I have heard people say Modge Podge works for them, but I’ve never tried it. I apply my final top coat or isolation coat after mounting the work. I apply it to the work AND to the support (and sides of the support, if they will be exposed) all in one coat. This gives me a uniform finish, and little more insurance to seal the edge of the work to the support. I apply the varnish layers AFTER mounting, in case I scuff up the surface in places during the mounting process, and to help seal everything further. I apply the final topcoat or varnish to the painting AND the sides of the panels. I usually apply 2 coats to the painting (again just to make sure I don’t skip any spots). I apply as many coats on the sides as I feel I need to get a nice finish on the wood. Comes in matte, gloss or satin, and you can mix to get the degree of gloss you desire. If you use Golden varnish, you can later remove it with household ammonia (which will not dissolve the isolation coat) and re-varnish. The varnish should be thinned with water before applying! If you try to use it straight out of the jar, it will be too thick and you’ll get brush marks. Follow the proportions given on the bottle for thinning. You’ll see that there are also proportions thinning for a spray application, and you might think that would give you a nicer finish. I have an airbrush, so I used to spray the varnish layers. What a waste of time! If you thin to the correct proportions for brushing (and don’t fiddle excessively), this stuff self-levels beautifully. There’s no need to spray it on. Several other manufacturers make removable acrylic varnishes (e.g. Holbein). However, I have not been able to find any besides Golden’s that are water-based. Most of the others don’t say what the base is in any obvious way on the label, but a little digging reveals that it is mineral spirits. And, instead of ammonia, you use mineral spirits to remove these varnishes, if need be. I’d rather not have mineral spirits in my studio, so I have not explored these products. A word about mouth atomizers for spraying acrylics . . .
You CAN use the type intended for (spirit-based) fixatives, but it’s hard work!. Almost every time, people look at the price difference and order the inexpensive ones. Then after they hyperventilate for a while, they order the Pat Dews one instead. It really IS worth the price difference, in my opinion, if your going to spray acrylic paints and mediums. The tubes are larger diameter, so they can handle the higher viscosity of acrylics without making you pass out! Either way, I highly recommend you do a little practicing before you try this out on a painting you love!